Ocean “Fertilization” – Governments Geoengineering Our Oceans With Industrial Waste | "Global Possibilities"
Though many have now heard of the ongoing atmospheric chemical spraying known as solar radiation management (SRM) and stratospheric aerosol geoengineering (SAG), most are still not familiar with another form of geoengineering, “ocean fertilization“. Yes, the same global powers behind the ongoing atmospheric spraying insanity have also been “fertilizing” our oceans. For those that are not familiar with ocean fertilization, the term refers to the intentional widespread distribution of massive amounts of bioavailable iron into our already-polluted seas, in order to encourage the creation of plankton blooms that then absorb and thus sequester CO2 from the atmosphere. Like aerosol geoengineering, ocean fertilization is contributing to the increasing “dead zones” around the globe. So, how can we know the extent of what the climate engineers are doing to our oceans without our knowledge or consent? 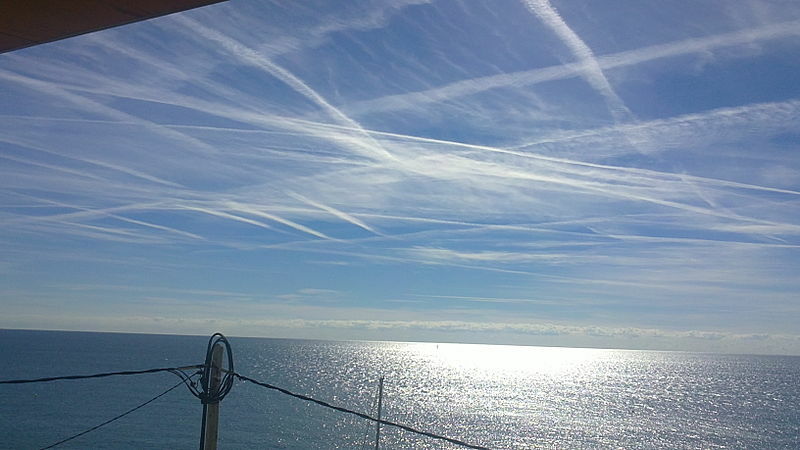 Could atmospheric spraying and ocean fertilization programs be directly connected? The answer is yes, a connection appears likely if all available data is examined. Could the materials being sprayed into our skies and over the oceans be composed of elements that are compatible for ocean fertilization? Again, the answer is likely yes. From whales, to insects, to humans, the entire planet has now been completely contaminated with highly toxic bioavailable heavy metals and chemicals, directly connected to the ongoing solar radiation management (SRM) programs. Peer reviewed studies on nearly 1000 whales from around the globe showed “jaw dropping” levels of aluminum had been absorbed in their bodies. Since whales breath air, they are likely being contaminated both by respiration and from the now contaminated food chain. New studies now also show the same results for the collapsing bee populations around the globe. In fact, all invertebrate populations are in sharp decline. And what about human exposure? The results are the same. It has recently been suggested that coal ash is the primary material being used by the climate engineers. Though this theory may potentially be a part of the geoengineering equation, there are too many applications of climate engineering to conclude that a single source of material is being used. Aluminum is a known primary element showing up in many lab tests of precipitation around the globe, and is also named in numerous climate engineering patents. Dangerously high levels of elements such as barium and strontium have also been found in soil samples; none of which should be present in our soil. Immediately after two major global climate conferences in recent years, Cancun and Copenhagen, aluminum futures went up significantly. Did geoengineering get the go ahead for further ramp-ups of their programs at these conferences? Were deals made behind closed doors? It seemed someone was buying a great deal of aluminum just after these international climate conferences. In the case of ocean fertilization, bioavailable iron is the primary material needed for the creation of plankton blooms. Is it possible that the toxic waste material from steel processing (called “slag”) could be used for engineering our oceans? And have scientific studies been done to study the use of this industrial waste for ocean fertilization? Yes. Is this waste “slag” material toxic? Yes again. 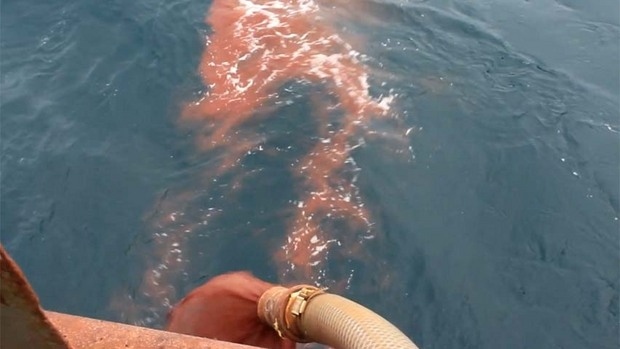 If we ignore for the moment the fact that iron slag is toxic, does ocean fertilization hold any potential benefit for the planet under any circumstances? Available independent studies say no. Any perceived benefit from Co2 uptake is far outweighed by the long list of consequences. Yet, in spite of the known negative effects, there will always be those who attempt to sell ocean fertilization as a “cure” to excessive CO2 in our atmosphere. By undertaking geoengineering of our oceans and atmosphere, those in power have already committed the greatest and most deadly crime in the history of the human race, and that crime is ongoing. The criminal cabals that masquerade as governments today are not about to stop, in fact, they are doubling down and further ramping up the deadly atmospheric spraying. There is virtually no place to hide from the lethal fallout and the deadly effects are erupting throughout the web of life. The global contamination of heavy metals and the health implications of this contamination are unprecedented. Why? Climate engineering is the most powerful and most utilized weapon of the western power structure. Many believe that our “elected officials” would do something about the situation if they only knew, but is this reality? Sadly, our government and all those working at its highest levels are completely bought and paid for by the power structure. I know this first hand after twelve years in this battle. I have been in senator Barbara Boxer’s office presenting hard science data on geoneingineering… I have had high level meetings with Californian Environemental Protection Agency officials… I have spoken in front of the entire California Air Resources Board, presented in front of the California Energy Commission, and had a private meeting with the Lieutenant Governor of California, Gavin Newsom and his top aid at the State Capital. All these meetings were complete dead ends, no matter how much credible scientific data they were presented with. In the next 4 minute video below, I publicly confronted U.S. congressman Doug LaMalfa with water testing data from California EPA which proves aluminum is flowing through California’s rivers and streams. What did congressman LaMalfa and his staff do with the data presented from the California EPA? Their final response was: they did not recognize the EPA’s information as being valid. LaMalfa, along with all those already mentioned, continue to stonewall the critical climate engineering issue. This is what they are all paid to do. Can we be absolutely sure that aerosol spraying is occurring in our skies? We have indisputable film footage to prove it as is shown in the 2 minute video below. Though there are many contributing factors, the capability for ocean fertilization to destroy ocean life should not be underestimated. From all available data, it appears very likely that the same global powers behind the ongoing atmospheric spraying insanity have also been “fertilizing” our oceans with the method of dispersion also used for solar radiation management, jet tanker spraying. Creating sun blocking (toxic) SRM clouds over the oceans, this material settles out of the atmosphere and becomes ocean fertilization material. Ship dispersion is very likely a part of the ocean “fertilization” process. As a result, massive dead zones in the seas are expanding around the globe, even shellfish are disappearing. The die-off of sea stars along the North American West Coast has already been horrific. Much of the Eastern Pacific ocean is superheating. countless species dying are seals which have been littering West Coast beaches. A mass invasion and die-off of red tuna crabs is still occurring along the beaches of Southern California and Northern Baja. Earlier this year beaches in Northern California and Oregon were blanketed with a mass die-off of “Vellela Vellela”, a cousin to the jellyfish. Sea birds are starving. In a short time, rapidly rising levels of greenhouse gases and heat will intensify algae blooms and marine die-offs. 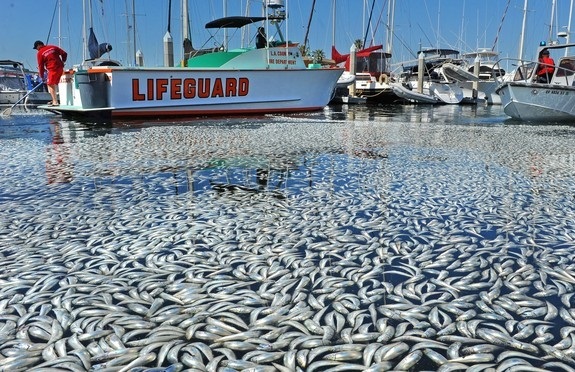 “Red tides” and the death they bring to the seas will continue to increase. We are in free fall toward what is known as “Canfield Ocean”. The oceans are acidifying and dying, and if the oceans die, we die. All form of geoengineering are nothing less that an all out assault against all life on Earth. The fight to preserve life on our planet is not somewhere in the future, it is now. Educate yourself, arm yourself with credible data to pass on to others, and join the fight. Dane initially focused his efforts and energy on the geo-engineering issue when he began to lose very significant amounts of solar uptake due to ever-increasing “solar obscuration” caused from the aircraft spraying in his area. He also noted significant decline in forest health and began testing and researching into geo-engineering about a decade ago. Today Dane is the lead researcher for geoengineeringwatch.org, investigating all levels of geo-engineering from stratospheric aerosol spraying (SAG) to HAARP. 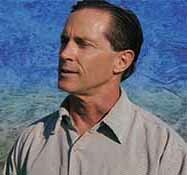 He assisted Michael Murphy with his acclaimed production of “What In The World Are They Spraying?” and has spoken extensively in a wide range of forums to explain the environmental dangers we face on a global level. 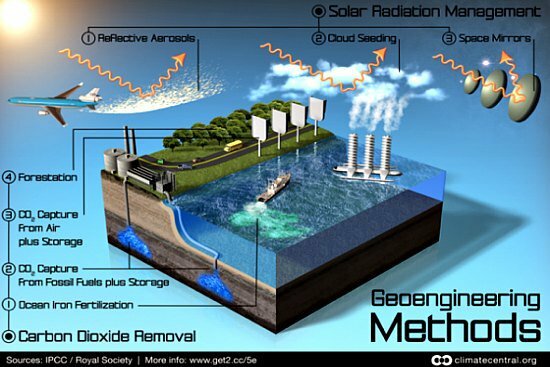 For more information, visit geoengineeringwatch.org and geoengineeringwatch on Facebook.